Image Musical Theatre production of Pinocchio at Reynolds Academy. Pictured in the front row are Reynolds Academy pupils Mia Hinesman, Lola Gray, Eva Wortley, Bradley Siddle and Tia Holingsworth. Middle row: Harvey Matthews, Finlay Weatherill, Denny Mecena and Saraiah Morrison-Swallow. With them on stage are Image Musical Theatre actors Jordan Howlett, Kerry Hughes and Jenny Watson as Pinocchio. Pupils at Reynolds Academy in Cleethorpes and Pilgrim Academy in Immingham also took part in the production, with the theatre company travelling to both schools to perform its original version of the fairytale. 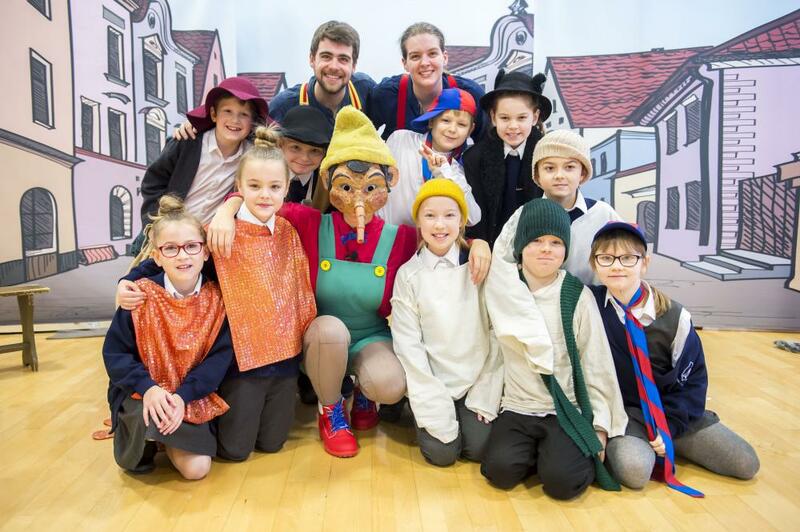 Kayleigh Plumtree, English Co-ordinator at Reynolds Academy, said: "This was a wonderful performance of Pinocchio by Image Musical Theatre for pupils in Years 3-6. The children are studying Pinocchio in English so they really enjoyed the performance. They did a workshop involving singing and acting, which is good for their confidence. It is also a good way to experience a story being performed. It brings the book to life."